Winc Design Limited is a Hong Kong-based company. Gaëlle Wizenberg , president of Winc Design Limited, decided to create Charlie Banana®, a collection of baby and children’s products that combine eco-friendliness, quality, and design in one brand. In creating Charlie Banana®, Gaëlle drew inspiration from her own two children. They have carefully selected every fabric, and they use Oeko-Tex suppliers wherever possible, and eco-friendly fabrics like organic cotton and Tencel. 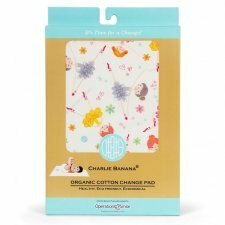 The Charlie Banana® change pad is made of 100% organically grown cotton. Our change pad's waterproof layer provides comfort and protection to change your baby on-the-go or at home. It is perfect to change your baby on the changing table and easy to toss and wash. 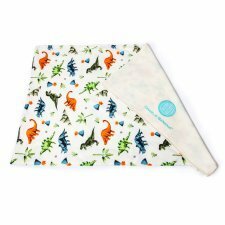 Very useful while breastfeeding in bed, to place on top of car seat while potty-training, a waterproof cover that can be used in a multitude ways. 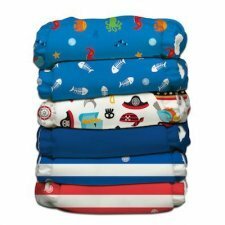 1 Pocket OneSize cloth diaper + 2 micropile absorbing inserts. The Charlie Banana Washable Diaper is soft, practical, dries quickly and has a slim fit. It is possible to insert both washable and disposable inserts. One Size Diaper from Three-Month to the passage to potty thanks to the adjustable Bra System and buttons in the waistband. 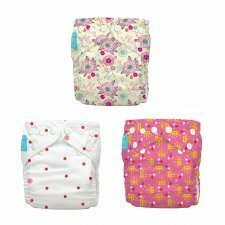 Kit consisting of 3 Pocket OneSize cloth diapers + 6 micropile absorbing inserts (3 medium-large and 3 small size). The Charlie Banana Washable Diaper is soft, practical, dries quickly and has a slim fit. It is possible to insert both washable and disposable inserts. This pack comes with 3 diaper shells, 6 Hemp inserts (3 medium-large and 3 small size). The Charlie Banana Washable Diaper is soft, practical, dries quickly and has a slim fit. It is possible to insert both washable and disposable inserts. Kit consisting of 6 Pocket OneSize cloth diapers + 12 micropile absorbing inserts (6 medium-large and 6 small size). 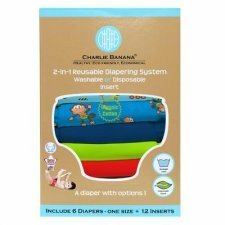 The Charlie Banana Washable Diaper is soft, practical, dries quickly and has a slim fit. 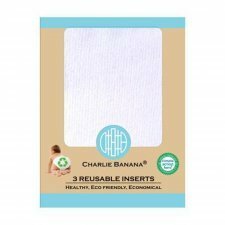 The Charlie Banana disposable inserts are designed for use on special occasions where you are looking for more practicality and speed nappy change such as when traveling or when letting your baby go to grandparents or baby sitter. Useful inserts also make it easier to get used to the cloth diapers passage. Place the inserts between the micropile part of the diaper and the baby's skin. Once used throw in the bucket. 4-layer microfibre washable insert for maximum and fast absorption. At the same time leaves the baby's skin perfectly dry. Can be combined with any pocket diapers and with Charlie Banana OneSize AIO. Charlie Banana® Hemp Inserts are especially designed for parents seeking natural fibers for children in need of heavier absorption. Hemp is well-known to have those properties. 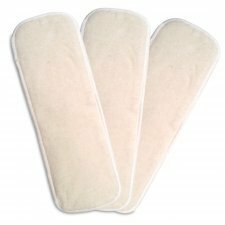 These inserts have 4 layers inside – 2 layers of microfiber, and two layers of hemp fleece composed of 55% hemp, 45% cotton. This is a great combo because microfiber absorbs quickly and hemp can hold larger quantities of liquid. Our stylish and secure Reusable Swim Diaper is ingeniously made of one waterproof layer and one ultra soft and aborbent TENCEL® fabric layer. Lenzing TENCEL® is highly absorbent, restricts growth of bacteria, is the greenest celluloid material currently produced. Smart sizing for the perfect security and ultimate fit. Soft against your child's tender skin - trimmer than disposable (won't swell up). Adjustable waist ties for extra security. So soft inside and so adorable that they can be used as underwear, bloomers, potty training accessories too! Reusable product means that you will enjoy using it wash after wash. Saves your family's money while helping to reduce waste. Proud Sponsor of the US Swim-School Association and approved at ALL public pools and parks. 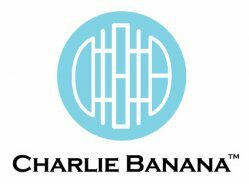 Whenever you purchase a Charlie Banana® product a portion goes to Operation Smile or any of the charities that we actively support. 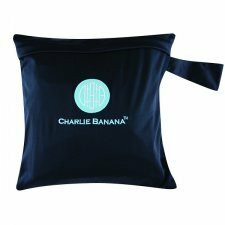 The Charlie Banana® waterproof tote bag is an essential item for any cloth diapering parent on the go. Use it away from home for storing your wet and dry diapers. No spill, no smell, no mess. The stylish black tote with our signature embroidery has a convenient wide handle that can be hooked to anything. In addition to diapers, it can also be used to store items such as wet swimwear, baby bottles, formula and exercise clothes. A long lasting item. It is small enough to be tossed in any diaper bag or any big hand bag. It can fit 3-4 diapers. It is made from the same waterproof material that we use to make our diapers. Zip closure.